This is a trail on the western slopes of the Catalina Mountains below Samaniego Ridge. Most of these trails in this area are used as mountain bike trails but do see some hikers, especially as you get higher up on the slopes of Samaniego Ridge. There is a maze of trails in this area many of them are not official named routes. Signage in this area is nonexistent. This trail is entirely on National Forest but access is from State Trust land and a State Trust Land Permit may be required. I was informed by the locals that hiking in the area didn’t require a permit but parking on state Trust Land probably does. The rules for State Trust Land require that you get a permit if entering Trust Land. I went on line and got a year pass for $15.00 to be on the safe side. The Majority of the trails in this area are on National Forest but the Trail Heads are on Trust Land. Access to the Middle gate Trail is from the Golder Ranch Road Trail Head. This trail starts on State Trust Land along the 50 Year Trail where the dirt Road crosses a cattle guard. This is the same trail head used for the Baby Jesus Trail. There are no trail signs here so knowledge of where the trails start is important. From the trail head do not take the 50 Year Trail, The 50 Year Trail heads off to the east or west but stays to the north of the cattle guard. Instead head to the southeast crossing the cattle guard and follow the dirt road for about 300 feet and take the trail that heads off to the east from the road. The Middle Gate trail heads east and crosses an unnamed wash and 100 yards after that it crosses Sutherland Wash. Once across the Wash you enter National Forest land. This trail is 2.5 miles long and has an elevation gain of about 300 feet in the first 1.3 miles and then the next 1.2 miles drops back down almost all of the 300 feet where it ends at the middle gate on the 50 Year Trail. This trail is heavily used by mountain bikers and is easy to follow. Middle Gate Trail follows along the lower hills and parallels Sutherland Wash and its main attraction are the boulders that the trail winds through. The last half of the hike is downhill and enters a wash and small canyon that will lead to the 50 Year Trail. From this trail the Cherry Tank Trail can be accessed along with the 50 Year Upper Trail. 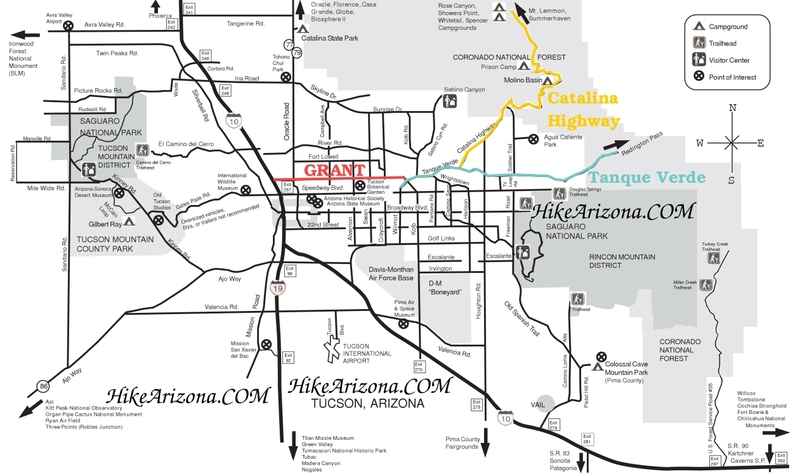 Other than the boulders and a short stretch along the wash leading to the 50 Year trail there is not much on this trail, views other than Samaniego Peak and Ridge are minimal due to the lack of any elevation. This trail can be used as a connector trail to other trails. AZ State Land Recreational Permits are available for an individual ($15.00), or a family limited to two adults and children under the age of 18 ($20.00).